Logic (AND, OR, XOR) function among illumination value, movement detector. Can be set Master-Slave inter working, the master output with 3 data types. 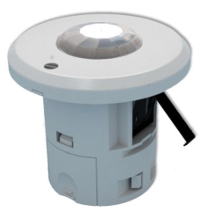 Sensor MBD is a device that can sense movement signal and brightness signal, and transmit induction information to other devices, such as dimmers, relays. The Sensor MBD is mainly used with the brightness of the occasion, or the need to monitor the situation, if there is subject movement, and then it will perform actions.